Windsor is the most lovely show, with probably one of the most lovely all-weather rings in Europe. 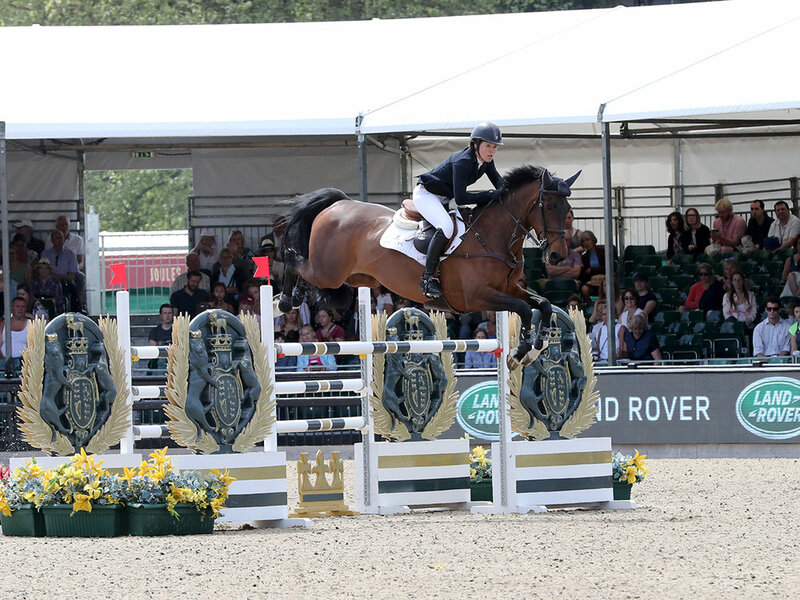 It's popularity is well demonstrated by the fact that the National Jumping Classes are 100% oversubscribed which is very sad, as really everyone should get a chance to jump at such an iconic show. This year a ballot system was used, and I am not sure whether this was actually fairer than the previous system of first come - first served. I was lucky enough to get Emma into the A & B jumping and Kvint into both B & C classes. Sadly, Marine and Emie didn't manage to get in, but it was great to see Marine on the course-building team, very busily rushing around putting up fences that were bigger than her. I had a good lesson with Shane on the Monday to make sure we were totally confident. Both horses jumped really well and Kvint jumped some enormous fences, and I got a good squaring up for my riding on Emma, so we were as ready as we would ever be. Because Kvint will not stay in the lorry on his own Sian Meehan joined Steff and I on Wednesday and had the unenviable task of looking after Kvint while I jumped Emma. I was early to go in the class which is a little bit of a mission as Windsor is a show with serious walking between the lorries and the rings. Emma warmed up really well and jumped a fabulous round. She had two fences in a very fast jump-off round which was a pity as there were only four double clears so we could have afforded to be fairly steady. She finished 12th which was a great improvement on last year, and if I couldn't win myself then it was definitely the next best thing to watch Georgia defend her 2017 win - this time on Z7 Qamar. We had a fairly long wait before Kvint jumped in the B section of the B&C jumping. This was quite an ask for him as it was the first time he went straight into a 1.35. He jumped very well, just having a couple of early fences where perhaps the height took him by surprise, but I was very pleased with him, and I took the decision to bring him back the next day. On Thursday I fed the horses at 3.30 to leave at 5.00 for Kvint to jump in the B&C at 8.00. I thought the course was much easier for him and only 1.30 which would make a big difference. He jumped a really nice round, just having four faults, which kept him out of the jump-off. However, he didn't feel his usual bouncy, brave self the whole way round, and I think that standing on the lorry for 10 hours on Wednesday and his 3.30 start on Thursday maybe took a bit of a toll on his energy. It was great experience for him however, and I hope this will stand him in good stead for Bicton next weekend. As always many thanks to everyone who makes it possible for me to compete at this level. Without Shane Breen's help and the confidence he gives me I would still be jumping 1.10 rather badly, and without the help of Steff, Camilla and in this case Sian, I would be challenged to get anywhere. Saracen have been feeding the horses for nearly 20 years now, and I have complete confidence that they are always feeling their best, and I love my MacWet Gloves. Tracy Priest very kindly asked Mark and I to join her on her table on Sunday, so we watched the 5* classes in splendid comfort and had the most delicious lunch. Well horses are great levellers - you can never quite tell what is going to happen next. I have had a few really great weeks, especially with Emma who is now Grade A and after Chepstow was standing 25th in the Gold League. Neither of these have any real meaning, but still, it's nice to have produced a horse from a three year old to Grade A myself, and also I am proud to see our names on the Gold League list, which only records results of 1.35 and over. I went and had a good lesson with Shane after Pyecombe and didn't think Benny was quite himself and so made the decision to leve him at home for Windsor. When the alarm went of at 3am on Wednesday I did wonder why on earth I thought Windsor was a good idea. However it is a lovely show and it is very good for the horses to experience such an amazing atmosphere. Even though Catokyo was late to go in the Foxhunter the class started at 7.15 and the ring is a long way from the lorry park. Catokyo is such a cool character that she was totally unphased by the atmosphere and wandered happily into the main ring. She was a little bit distracted by the big screen and had two fences down facing it, but she jumped better and better and next year she'll be really ready to be competitive. We then had a long wait for the A & B jumping, possibly the Foxhunter could have started a bit later! Emma was last to go and I didn't think the track was too big. She just had the middle of the combination, maybe I wasn't quite straight enough and the last fence in the first round. It was a super competitive class which Georgia Tame won convincingly, and last year I would have thought it too much so I was really pleased with both horses. Steff and I were up at 3 again on Thursday with Emma early to go in the A & B jump-off class. Unfortunately Steff didn't get to see anything as Catokyo got herself stuck on the tack lockers and had to be rescued by several firefighters. Catokyo then refused to settle in either our lorry or the Breen lorry so Steff had to stay with her while Julien and Jo Marsh-Smith gave me a jump. Emma really jumped magnificently until the second last fence where she had the second part of the double. She the really ran me to the last fence and completely ran out of room so rather piled into it. She came round and jumped it perfectly- so not upset and hopefully she might be more inclined to take advice next time. When I spoke to Michael Quirke he said he thought it was a big and difficult course, she made it feel so easy until the very end, so we just need to keep tipping away and we'll get it all right. When I got back to the lorry Catokyo had finally calmed down and Steff had done a great job of looking after her but she had a very sore and swollen leg so we had a quick look round and then took her home. This morning she is pretty sound but still sore so we will give her loads of TLC and she will see the vet on Monday. Ideally I would never have tack lockers in the horse part of the lorry, but with a second hand lorry you can't always get exactly what you want. This is the second accident we have had with the lockers in four years so they are not something I would recommend. Jemma Tester very kindly rode Benny and mucked out both days which was wonderful. I think next year I might try stabling for the middle night. It is expensive, but I don't think any of us are at our best when we get up in the middle of the night. The horses have a slightly quieter time planned now until after Anna's wedding on 3rd June. We are currently on our way to Yorkshire for my godson, Edward Green's wedding which will be full of old friends and great fun.